Copyright 1995, Naoko Takeuchi and Kodansha Ltd. It was the time of the Silver Millennium, when all the planets were at peace, the universe was a happy place, and the Moon Kingdom the happiest place of all. There were fireworks and parties every night, and dancing and laughing. Queen Serenity, ruler of the Moon Kingdom, raised her daughter Serena to follow in her footsteps and rule the Moon, but most of the time Serena spent staring at the Earth, for she had fallen in love with a young man from there. Darien was his name, Prince Darien of Earth, and he would come and confide in her about the terrible things happening on Earth and the Evil Powers taking over there. Serena knew that Darien had to go and protect the Earth, but by the time he would get back to Earth, all might already be lost. This Queen Beryl had come out of nowhere. No one knew where she had come from, and she was amazingly strong, maybe even unbeatable. The guards of the Moon Palace suspected everyone from Earth, so Darien had to flee again, but not before saying good-bye. Serena was so happy when he came back. He couldn't leave without having one last dance with her. He explained to her that everything was going to change. That Beryl was more dangerous than he had thought. The whole universe was in danger, especially the Moon. Beryl wanted to rule the whole Universe, but to do that she had to first conquer the Moon. He warned Serena to prepare for the worst. 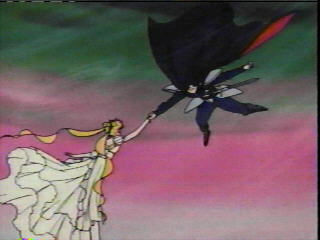 He also explained that Queen Serenity knew he wasn't a spy and had asked him to stay and help protect her kingdom. Serena couldn't believe that all this was really happening. Queen Beryl was absolutely relentless and would destroy everything in her way to get exactly what she wanted. Darien proceeded to fight as hard as he could, but he warned Serena that he might not come back. Before parting, he assured her of how much she meant to him. Serena gave him her Star Locket, and they swore they would always be in each others' hearts before they kissed good-bye. I'll Never Join Up With a Snake Like You, Beryl! Just then, the attack was launched on the Moon Kingdom by Queen Beryl and her most devoted Generals under her control. The Sailor Scouts, Sailor Mercury, Sailor Mars, Sailor Jupiter and Sailor Venus, tried to fight against Queen Beryl without success, and were taken away by the Evil Forces. Queen Beryl then turned her attention to Princess Serena, but Prince Darien arrived just in time to protect her. Queen Beryl found herself very attracted to Darien and offered him to join them and rule the whole universe by her side. 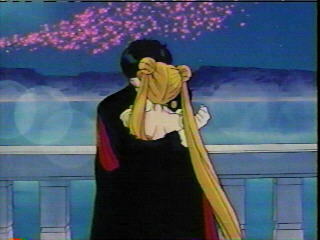 Disgusted, Darien refused, and in the next instant was taken away, leaving Serena behind, screaming to her, "Run Serena! Run!" 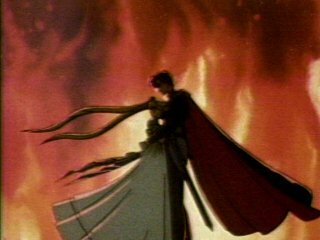 The Princess ran towards Darien and was also sucked in by the Evil Forces. Queen Serenity came forth to rescue them, but it was too late�they had fallen into a deep sleep and were floating amongst the carnage, away from the Moon Kingdom. Queen Serenity couldn't let it end this way. She refused to let them take away her daughter's future that way. So she took out the Silver Imperium Crystal and put it on her Wand for maximum power. 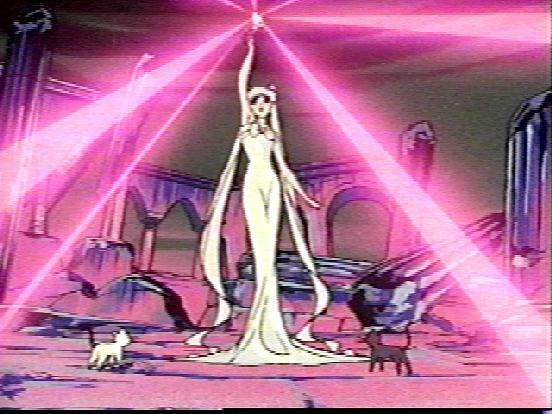 The Queen's cat advisors, Luna and Artemis, reminded the Queen that if she used her Silver Crystal she wouldn't have any strength left, but Queen Serenity knew it was the only way. She had to sacrifice her kingdom if they were to defeat Queen Beryl and regain their peace. So, with the words "Cosmic Moon Power," she united all the energy of the Universe to get rid of the Evil Forces. She couldn't destroy them since that would have destroyed the others as well, so she trapped them all inside her Crystal and then sent them to a new future on Earth. Queen Serenity had saved them all, so Luna wondered why she looked so sad. Queen Serenity explained that it was because none of them would remember anything of Moon Kingdom, and worst of all, she would never see her sweet daughter again. But that was the only way for any of them to live on. She had just enough power left to send everything Luna and Artemis would need in the future on Earth. Serena and her Court would need their help if the Negaverse were ever to break free again. Queen Serenity explained that all of them would be reborn on Earth with no memory of the Moon Kingdom whatsoever. But if Evil Forces should try to repeat what happened there, they would know what to do. And looking at the Crystal in her hand, she said, "Farewell, all of you, and good luck. Good-bye, Serena. You are in my heart always." The Imperium Silver Crystal released everyone and sent them to Earth. Queen Serenity then said, "Be happy. . .on behalf of the Moon you will be free again". The last of her energy spent, Queen Serenity fell into a deep sleep hoping that perhaps they would meet again. With that, she dropped her Wand, and Luna and Artemis were encapsulated to also be sent to a peaceful future on Earth.